The United States Life-Saving Service, formally instituted by Act of Congress in 1871 and incorporated into the Coast Guard in 1915, was justifiably proud of its tradition of hazardous duty and outstanding heroism. Vested with the responsibility of maintaining a constant vigil along the most desolate and dangerous stretches of the American coast, the surfmen were frequently called upon to rescue the crewmen, passengers and cargoes of vessels that had collided, stranded, capsized, foundered, caught on fire, etc. In addition, they regularly assisted the Lighthouse Service (now also part of the Coast Guard) in rendering aid and installing signals and warnings to shipping along the coast, saved innumerable swimmers and boatmen from drowning, and participated in the shore patrol during wartime. 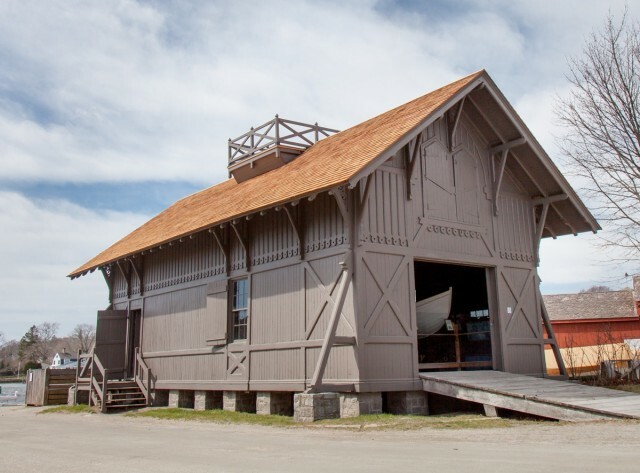 Constructed in 1874, the New Shoreham Life-Saving Station is one of the last survivors of the many Atlantic seaboard stations built to government specifications from Maine to Florida. It was in use for about 16 years in Old Harbor on Block Island, Rhode Island. Before the turn of the century it was auctioned off, moved several hundred feet, and used as a stable and blacksmith shop. In 1967 it was purchased by the Block Island Club and moved another two miles overland to Great Salt Pond, where it was to be converted to a clubhouse. In July 1968, it was brought to Mystic Seaport by barge in exchange for a reproduction. The history of the building is one of the most complete of any at the Museum. Nicholas Ball, a Block Islander and U.S. Congressman, was instrumental in having it built in 1874 and became its first keeper. Later he was assistant superintendent of the Third Life-Saving District. His great-granddaughter, Mrs. Weldon Dodge, librarian on Block Island, has made meticulous records of the station available to the Museum. The station was formally dedicated in 1975 and is now on its permanent location at Mystic Seaport. The building faces inland, as it did in Old Harbor, so that the large doors are accessible to the town roads when moving the surfboat or beach cart. The boatroom has original gear for the two most common methods of rescue: the breeches buoy (see below) and the surfboat. The messroom has representative equipment used by the seven men who manned this station eight months a year. The upstairs area contained the sleep and storage rooms but will not be set up as an exhibit because of access considerations. In March 2016, The Champlin Foundations gave Mystic Seaport $17,500 to re-roof the New Shoreham Life-Saving Station. Read the news story.